Keeping my promise to myself to conserve art time, I created this art journal page in two 15 minute shifts over two days: the first used to collage the background and the second to add the paint layer. I painted the negative space so that the pig emerged in the collage layer while the background got knocked back a bit by using diluted acrylic. 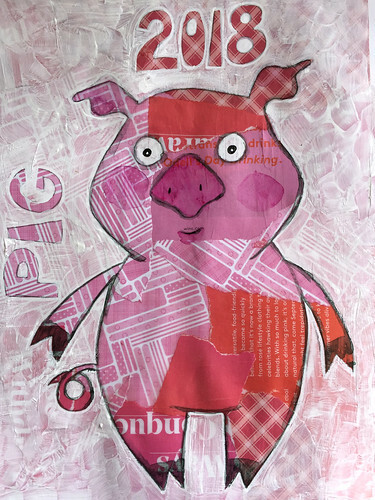 The pig is the subject of my first art journal page of the year because 2019 is the year of the pig according to the Chinese zodiac. I love pigs and love drawing them so any excuse to create a pig is all right by me. *Edited to add* Many thanks to bcparkinson for pointing out my error. Oops! Can you tell I created this late at night? Oh dear. I’ll have to do the art version of white out and collage over the 8 and turn it into a 9. Lesson learned, people: best not to commit thinks to ink or paint when you are bone tired. What a cutie, I love the collage! I’m with Sharon – the collage is terrific. You’ve hit the ground running, Laura! Cute pig ,but why 2018? We used to raise pigs and there is not much that is cuter than a baby pig. they just know how to have a good time. Bwah ha ha ha! Oh my gosh! Thank you for spotting that and pointing it out. Can you tell I made this late at night? Good grief. That’s too funny. I’ll have to do a repair job and change it. I love your pig, and I always love your art. Thank you for sharing your amazing talent with us! Thank you. I’m glad you enjoy seeing my doodlings. Oops! It IS always hard to get used to writing the new year. Less hard than it used to be, though, in the days of cheques and handwritten letters! Strangely enough, this January I have not actually slipped up once on any paperwork or cheques etc. That makes it even funnier to me that I stuffed it up when I was writing more slowly. I like the whole thing. Confused pig is really cute and it doesn’t matter if he knows what year it is or not. I will see he looks a little bewildered, maybe it’s at all the attention! The collage is really effective. Thank you, Claudia. Yes, he does look rather befuddled, doesn’t he? The 8 is now a 9 and, if you were not aware of my blooper, I don’t think you’d detect it was a patch job. I could have left it as a reminder of this silliness but I wanted a “year begins” marker in my art journal since I use them as records of my experiments and progress through time. That’s exactly what I did. I just stuck a little scrap of the same paper on top of the 8 and then negative painted in the 9. Far easier than an error made with ink! Oh and I liked the typography you did for the word “pig” and for the year numbers! Thanks! Zero thought went into that. Sometimes zero thought brings out the best work! It’s a weird paradox: you can think too much and it’s mush – or think very little and it’s magical. Well you managed magical!! Good job! I love it! You should really be illustrating children’s books. My girls would have loved your adorable pig! Thank you. I’d love to illustrate books regularly. I’ve done one that’s been published and done a few one-offs that were gifts to a specific child. Aw, thanks so much, Mark. I really appreciate your feedback and encouragement. I wish I’d thought of using the curled tail to become the 9. Yes, I illustrated a book for an 11 year old author. I made articulated paper puppets that were photographed against collage backgrounds. It was a fun project and I was thrilled to help a young author fulfill her dream. It’s called ‘Mama gets me Mangoes’. “Mama Gets Me Mangoes”– man! that sounds like my kinda book!! Well, I do hope you’ll consider writing and illustrating one of your own. I have every confidence it would be outstanding– and that’s no joke. Thank you. I think I would love to illustrate book covers and maybe the odd illustration for a chapter book. I worry that with picture books I would stuff up the consistency of the drawings. I have had people ask if I would consider illustrating a graphic novel too – because my kids are into those – but I know for sure I would lose the consistency drawing the same characters etc that many times over, probably because I would get bored. But I would love to try my hand at a bit more illustration. I am actually contemplating a commission to illustrate a music text book for kids so that could be fun. That’s a very good thought. I have actually had a couple of ideas for books that would be on a theme but with a different character and text with each turn of the page. I might get around to producing both of those just for my own pleasure and see where they go from there. Once again, I really appreciate your encouragement. You are a great cheerleader.